Are you stressed and frustrated when it comes to flirting with a guy? 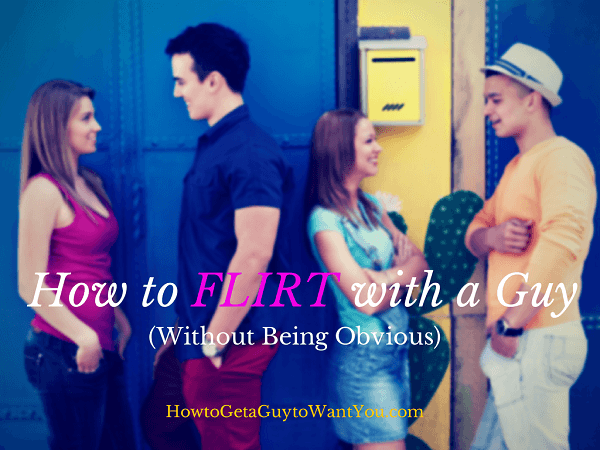 Do you feel awkward and painfully obvious when you try to get a guy’s attention through flirting? Flirting subtly with a guy is an “art” that some women seem to be born with, while others avoid in sheer panic that the guy will disappear before they finish their first sentence. Here you’ll discover the simple secrets to handle “guy-situations” without stress and frustration. Learning these few simple “tricks” will turn you to a master of flirting and from “nice” to irresistible – faster than you can imagine. 1 Do All Women Need to Flirt? Well, if you’ll ask a supermodel, then no. Supermodels, and other women who look like them, get approached by guys so much that they don’t really need to flirt to get a guy’s attention, right? But since most of us are not human Barbie dolls, flirting can be a powerful tool. So powerful that it can help you get any guy you want, no matter how you (or he) look like. A few years ago I worked with a woman who not very attractive-looking, to say the least. We were 8 women, all of us better looking than her, working with about 15 single men. It didn’t take long before I noticed that she was getting most of these men’s attention and was constantly being asked out on dates. I was so curious about this that I literally followed her around everywhere. I quickly realized 2 things that set her apart from the rest of us: She was extremely confident, she smiled literally all the time, and she was a master at flirting – without being obvious about it at all. Guys tend to be attracted and drawn to women they can flirt with. At the same time, they are turned off by women who flirt aggressively and show their obvious attraction, because they like to feel they have made the first move. And no, winking at a guy is not flirting. It’s a way to make him think you have a nerve disease. Well, it’s not as complicated as you think. Knowing how to flirt with a guy in a subtle way, will get you his attention and his (uncontrolled) attraction towards you – before he even understands why. When you’re trying to get a guy’s attention from afar, stare at him until he becomes aware of it and makes eye contact with you. Don’t look away when he does! This is the ultimate way to flirt without being obvious. If you already talking to the guy – keep eye contact as much as you can. As you listen to what he says, look in his eyes and don’t stop. After a few minutes, he will feel like you are looking into his soul. This subtle way of flirting requires a few minutes of thinking. If you already know a few things about your crush, use them to start a conversation. If you know he likes music, or some kind of sports – find a simple way to get him to talk to you about it. If he likes music, start a conversation about a concert you really want to go to. If it’s football – comment about the last game that was in the news. If you don’t know anything about him, look at his sneakers, his T-Shirt, whether he has jewelry on him, anything that can be a conversation starter. When I was single I saw a cute guy on a flight to Los Angeles. I could see from his T-shirt that he likes some band. I was sitting one row in front of him, so I started playing my Ipod and casually got up and walked around with it, than got back to my seat after he saw me. 2 minutes later he asked me about what I’m listening to. We spent the whole flight talking and went out for a few dates in L.A. This is a powerful flirting method you can use with anyone, without making any “move” and without even having to make eye contact. Guys love it when girls run their hand through their hair. The next time you’re talking to your crush, casually run your hand through your hair (and smile if appropriate at that point). Or tuck your hair behind your ears to show off your pretty face. This will show him your confidence, while still being “girly” and vulnerable – 2 things a guy can’t resist! Guys, much like us girls, like to get a cute compliment. If you like something about a guy, make sure you compliment him about it. He will love it that you noticed something great about him, and if you find something that isn’t so obvious (like his looks, for example) – even better. But whatever you do, don’t fake it. Guys will notice a fake compliment and interpret it as a miserable attempt to flirt aggressively, which is not what we’re trying to do. I wouldn’t compliment a guy about his looks (too obvious) but I would compliment about his great sense of humor – if he really has one. Guys skip a beat when a woman who flirts with them suddenly (and gently) touches them. The only places “allowed” and recommended are his arms, his shoulder or his back. It makes them feel more comfortable and wanted, and more importantly – it makes them open to you when they talk to you and encouraged to flirt with you further. But don’t grab his arm and tell him how huge his muscles are. Nope. Subtle touching is leaning against him and putting your cheek on his shoulder for a split second while you laugh from one of his jokes. To tell you the truth, I always thought that you don’t have to be a flirting guru to get a guy’s attention, but that was before I stumbled upon Mimi Tanner’s program – Secrets of Flirting with Men. Mimi, who is a best-selling author of several dating guides, opened my eyes about the power of flirting to not just get a guy’s attention – But to keep it until he begs to be your boyfriend.  Her guide has the best advice I’ve ever read about how to use flirting to get a guy uncontrollably attracted to you, longing to get to know you better and make you his and only his. And best of all, she makes it seem so simple, that anyone can do it – even if you’re one of those that faint before they manage to get a word out around their crush. I highly recommend that you check out her guide (HERE) if you want to know exactly how to flirt with a guy – in any situation (face to face, texting, calling, anything). (She even teaches you the easy signs to help you find out how you’re doing in the process, so you can avoid embarrassment or humiliation…). Mimi claims that the ability to flirt with guys is the single most important love-life skill that every woman needs to know and that it can help you not only find the love of your life but keep him by your side forever. How about you? What’s the worst flirting experience you’ve ever had? What was your best? I can’t wait to see some of your stories in the comments. Thanks for posting this! Really helpful! Now people are saying we’re more friends, which is now true because of you, thanks! i think it will be nice for a girl to play with her hair when talking to a guy. my (male) friends thinks its makes a girl look confidence nice and cute. i’ve got a really big problem with eye contacts. I can’t really stare at my crush until he notice it. I’ll just feel nerveous. I tried it a few days ago and looked away when he noticed i was looking at him. Is there anything else you think i can do? Yes, you can try the other tips that I talk about in this post. Many people have this problem, don’t feel bad about it. Good luck!